Edie Eckman presents Every Which Way Crochet Borders was our featured guest today on Yarn Thing podcast with Marly Bird. Edie Eckman has her hands in many aspects of the fiber arts, teaching, writing, designing and editing. Her knit and crochet designs have appeared in many magazines, yarn company publications, pattern leaflets and books. Step-by-step instructions and symbol charts put these 139 creative new border designs within reach for beginning and advanced crocheters alike. 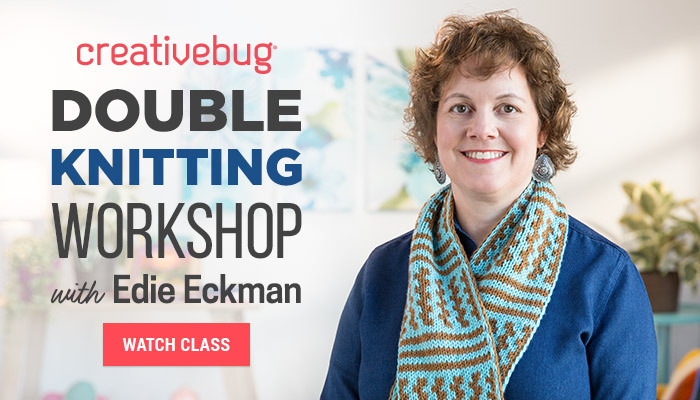 If you’re ready to chart your own crocheted course, Edie Eckman offers plenty of helpful design advice, including how to choose an appropriate border for each project and how to incorporate an element from the main stitch pattern into a new border design. She then explains, with the help of close-up photos, how the same pattern can have dramatically different results depending on the weight of the yarn. With each pattern diagramed to approach in both rounds and rows, Every Which Way Crochet Borders is an inventive and invaluable resource. Ravelry Designer page and Group. Edie has visited the Yarn Thing podcast before, in 2014. I was watching this podcast for the first time. Loving the community, even slenderly! So many different ways to learn. We have a new word “Slendery” I wonder if it will be add to Websters Dictionary, it should be. I really enjoyed the podcast with Edie Eckman I have taken a couple of her Crafty’s classes they were awesome. Well, I now have a new word — “Slendery”. I wonder if it will be added to the dictionary one day? I just started listening to your podcast about a week ago and I am hooked! I listen in my car, at work, and you have substituted netflix!! That has definitely shocked my husband! He has been handed over the remote so he thanks you as well. Just wanted to put in my ‘Slindery’ comment and say hello. Can’t wait for the next podcast. I will take advantage and catch up while we wait. Have a good two weeks. Looking forward to finding new ways to use the word “slendery” in my daily life….ha! Marly thank you for having Edie Eckman on your podcast. She is awesome and I can’t wait to get her new book as I want to add borders to my shawls hoping they will make me look slendery. So many good books to choose from???? Which to start with. Not quite sure how to use the special word in a sentence: How about I am not looking slendery today! Wonderful happy interview. Great big fun to listen to. I could hear the respect Marly has for Edie Eckman, it was heart warming. I bet her new book would help me on the slendery side of afghans I am bordering around. Love the podcast. I have all of Edie Eckman’s books and must add this one to my not so slendery library of crochet books. Thanks for the opportunity. Edie’s new book sounds awesome. Sounds like her cruise taking in the slendery architecture was wonderful. Loved the podcast!! Also love the new word slender. Missing Marly twice a week. Thanks for all you guys do. Great interview and great the book looks amazing!! I must have missed the definition of slendery because I have no idea what it means! But it’s a cool word. Another great pod cast Marly! I thought it was just slendery wonderful! These borders sound beautiful! I think I can use these on t-shirts to make me look more slendery. I am new to crochet and so really enjoyed being introduced to another wonderful designer ! I look forward top picking up Edie’s book and making my own slendery crochet borders! I love the idea of crochet borders on t-shirts. I want to try that and I hope that it gives me a slendery appearance. Thank you for this great podcast! I just started listening! Trying to get my slendery books to line up on the shelf. Borders, borders many SPLENDERY boarders!! Great show and wonderful guest!! I love Edie’s books, and I’m looking forward to taking a class with her at the Chain Link conference next month. Maybe If I wrapped myself in a shawl with just the right border from her book, I’d look more slendery! I wonder if adding a border to my tshirts will make me more slendery?? Never heard the word slendery before. Learned something new today. A brand new word – slendery – I love it. I rarely catch the podcast live but usually try to watch it the same day. Love Edies code word! I think I will be using the word “slendery” a lot! Lol. Currently borrowed Edies book from the local library but would much rather own it! I think I would use it a lot. Well…I don’t know about the new word Slendery, but this podcast did introduce me to a few new books at add to my wish list. What I enjoyed about this interview was that you could “hear” the respect that flowed both ways between Edie and Marly. Slenderly…..wish that described my body – alas – it does not! Enjoyed the podcast with Edie! Slendery things are always great! To become more slendery is an ongoing goal of mine. Slendery! I had to go back to the podcast and listen twice because at first I thought the code word was sPlendory instead of slendery, my mistake! I enjoyed listening to Edie and learning more about her and her craft. I love crocheting slendery borders for my dresses and skirts so this seems like a great resource. If crocheting borders on my clothes will make me look more slendery, then I definitely need Edie’s book. I have some of Eddie’s books, and they are great or Splendory. Would you say the borders are Bordery? Oops, was the word Slendery? I enjoyed the podcast and want the book! I love to crochet a border on crochet projects, knitted projects and woven projects. Would love some new slendery inspiration! The crochet borders book looks great. This summer I am doing a lot of crocheting and working out, so that I can be more slendery. Does this border make my scarf look slenderly? Enjoyed listening to the show! I love the way Edie and Marly chat about all things. The scope of this podcast was far from slenderly. I hope to get my hands on some of Edie’s books. I would love to improve my crochet. I would love to learn a new boarder that fits slenderly around my blankets! I love the new word ‘slendery’. The crochet borders are needing to be explored by me!! Can’t wait to try some on my projects.